Music played in Windows Media Player continues during and after a change of user. This should not happen. Music playback is designed to continue in the background and can no longer be controlled from the account you switch to. If you try to run Windows Media Player, it runs in a separate process. But there’s no point playing one track on top of another. 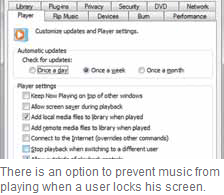 To take care of this issue, start Windows Media Player. To access the menus, right click in a free place on the upper toolbar or press the [Alt] key to show the legacy menus. Click ‘Tools | Options’. Change to the ‘Player’ tab. There you can activate the option ‘Stop playback when switching to a different user’. Confirm with ‘OK’. The changesare eff ective without needing a restart. The playback will now stop as soon as Windows displays the login page. Also after logging back into the original user account, the playback can be restarted.